If you’re new to matching gifts, investigating companies with programs is like opening a door to a whole new universe. The great news is that there are so many companies that match gifts — 65% of Fortune 500 companies, in fact! If any of your donors work for one of these companies, their gifts might be eligible for some of the best matching gift programs in the country. But it’s not just Fortune 500 companies that offer matching gift programs. There’s a chance that your donors’ employers, big or small, will double their employees' philanthropy. We'll outline the top 12 corporate matching gift programs, then talk about the next steps you should take to boost your matching gift strategy no matter where your supporters work! Take a quick look at your donor database. Do any of your constituents work for matching gifts companies like these? After your team reviews these top matching gifts companies, take a second look at your corporate philanthropy strategy. You might be missing out on an untold number of donations each year simply because you're not helping supporters access these funds! Let's dive into these impressive matching gifts companies so your nonprofit can get started raising more. BP offers an expansive corporate giving program that includes matching effort, time, and gifts. As an added feature, BP lets the general public track what organizations are receiving donations in real time online. The company matches at a dollar-for-dollar ratio all employee donations up to $5,000 per calendar year for both personal donations from employees and money raised by employees from family and friends. BP also provides a 100% match on money employees raise from charity walks, runs, and the like. Employees must submit their requests online, so keep the process all within one outlet by promoting matching gifts on your nonprofit’s online platforms. BP's volunteer grant program can bring in an extra $5,000 when an employee volunteers with a nonprofit for 25 hours in a single year. Click here to learn more about BP's matching gift program. What do these five segments mean for a nonprofit looking for matching gift funds? One, Disney has a lot of money to give. And, two, Disney has a lot of employees to donate to your cause. Disney offers matching gifts up to $15,000 at a 1:1 ratio. As an added bonus, Disney offers a program called Disney VoluntEARS to provide grants to nonprofits where employees volunteer on a regular basis. Disney's volunteer grant recipients can earn an additional $2,000 if they volunteer consistently with a nonprofit. Each year, Disney's "VoluntEARS of the Year" grant awards $2,500 to the nonprofit of the winner's choice. Click here to read more about Disney's matching gift program. The Ford Foundation was originally founded by the Ford family. Although it is no longer associated with the Ford Company, the private foundation manages more than $10 billion in assets and wields incredible influence world-wide. The Ford Foundation uses a very generous matching gift ratio of 3:1. So if one of its employees donates $600 to an eligible nonprofit, the Foundation will match with $1,800 of additional funds, resulting in a $2,400 donation! The Ford Foundation will match donations ranging from $25 to $30,000. With a 3:1 match ratio, those donations could go a long way! Click here to read more about Ford Foundation's matching gift program. The Gap Corporation (which includes Athleta, Banana Republic, Intermix, Old Navy, and Piperlime) will honor requests for matching gifts from employees for most types of nonprofits. Gap’s match limits vary according to the type of employee requesting the donation. Part-time employees are eligible for up to $1,000 in matched funds, whereas Senior VPs and other company leaders' donations can be matched up to $10,000. Gap also has a generous volunteer grant program that rewards individuals and teams who volunteer. Gap will provide grants ranging from $1,000 to $10,000 to nonprofits where employees are on the board. Click here to read more about Gap's matching gift program. GE is the grandfather of gift matching. In 1954, the GE Foundation created the Corporate Alumni Program, the very first corporate matching gift program. Since the program’s inception, GE has matched more than $1.07 billion to nonprofits. Now, more than 60 years later, the GE Foundation matches more than $35 million annually. General Electric will match gifts dollar for dollar for almost all 501(c)(3) organizations that employees donate to. The Foundation also has an incredibly high match limit of $25,000 per employee per year. Employees have until April 15th of the year following the donation date to apply for a matching grant. Part-time, full-time, and retired employees are all eligible to apply for a matching gift from GE. Click here to read more about GE's matching gift program. Johnson & Johnson’s employees and its retirees can have up to $10,000 of their personal contributions matched yearly for donations to most nonprofits. The company differentiates between current employees and retirees in its match ratios. Current employees are eligible for a 2:1 match (up to a $20,000 company contribution). A donation from a Johnson & Johnson employee could result in triple the funds originally given. For retirees, the company uses the industry standard 1:1, which is still a major funding boost for nonprofits. 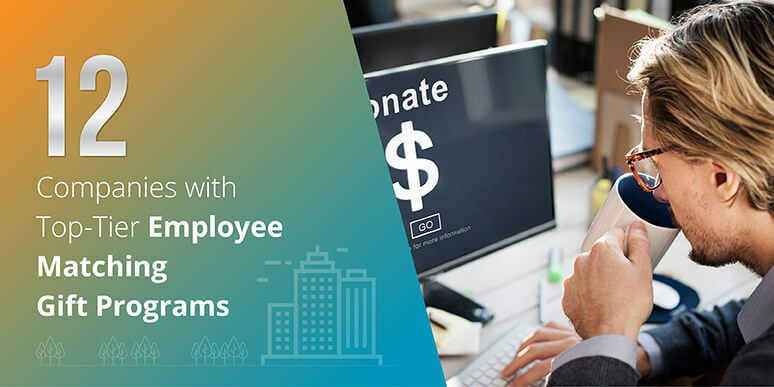 With a program like this in place, nonprofits will be able receive major financial benefits during an employee’s working lifespan and then continue to reap the fiscal rewards long into the employee’s retirement. Ensure that you have the right matching gift marketing strategy in place so you can secure donors like Johnson & Johnson employees. Johnson & Johnson employees have a whole year to submit their matching gift requests! Click here to read more about Johnson & Johnson's matching gift program. The Microsoft Corporation is the largest contributor of matching gift and volunteer grant funds. Microsoft matches an average of $53.2 million in employee donations every year. An impressive 65% of the company’s employees participate in the annual giving program, and Microsoft’s charitable records reflect that. Microsoft generously matches up to $15,000 per employee per year and offers volunteer grants worth $25 per hour volunteered by its employees. Microsoft will match any donation amount (up to $15,000). Donations as low as $1 are eligible to be matched! Click here to read more about Microsoft's matching gift program. Soros Fund Management has an incredibly large limit (company contribution) of up to $100,000 annually for each employee. It offers 3 to 1 matching for employee donations and 2 to 1 for partners. Soros Fund Management sets the bar high for what a matching gift program can accomplish for a nonprofit. Only full-time employees and partners are eligible. However, Soros Fund Management will match donations to most 501(c)(3) organizations as long as requests are made electronically within 1 year of the doantion date. With a cap of $100,000 and a match ratio of 3:1, it's easy to see why Soros Fund Management is one of our favorite matching gift companies. Click here to read more about Soros Fund Management's matching gift program. Apple is one of the leading technology companies, and it boasts an impressive matching gift program that full- and part-time employees can take advantage of. Apple will match donations ranging from $1 to $10,000 within 12 months of an employee donation. Additionally, Apple offers a volunteer grant program that donates $25 to a nonprofit for every hour that an Apple employee volunteers at that nonprofit. Even though they match at a 1:1 ratio, Apple has a huge range of match-eligible donation amounts. Click here to learn more about Apple's matching gift program (and to see more details of their volunteer grant program!). Chevron's full-time, part-time, and retired employees can all apply for matching gifts for their donations ranging from $25 to $10,000 (for employees) or $3,000 (for retirees). Chevron matches all donations at a 1:1 ratio, and most 501(c)(3) organizations are eligible to receive matched funds. It's important to note that Chevron only accepts matching gift requests through the company's online internal portal. Paper forms are not accepted. Employees have a long time to get in their matching gift requests! Chevron accepts requests until January 31 of the year following the donation date. This means that, in some cases, employees could have more than a year to submit a matching gift request. Click here to check out more details about Chevron's matching gift program. Nearly everyone uses Google in one way or another. And with more than 60,000 full-time employees, Google has no shortage of potential donors. Google's matching gift program will match donations at a 1:1 ratio ranging from $50 to $6,000. Like Chevron, Google will honor match requests that are made before January 31 of the year following the donation date. Additionally, Google has set aside an extra matching fund program that doubles employee donations (up to $6,000) to disaster relief efforts. Google doesn't just match "regular" donations. They will also double any money that employees raise before they participate in a fundraising walk or run. Learn more about Google's matching gift program by clicking here. Merck has one of the highest matching gift limits out there. The company will match employee donations at a 1:1 ratio ranging from $24 to $30,000. Retirees can have their donations ranging from $24 to $10,000 matched at a 1:1 ratio as well. Merck will match donations to nearly any registered 501(c)(3) organization. Employees only have 6 months (180 days) from the donation date to submit their request. Merck also offers a volunteer grant program that makes donations between $500 and $1,000 to nonprofits where employees regularly volunteer. Check out more details about Merck's employee matching gift program. Are you a Salsa Labs client? Do you want to raise more money with matching gifts? Learn more about Salsa Labs' integration with Double the Donation. 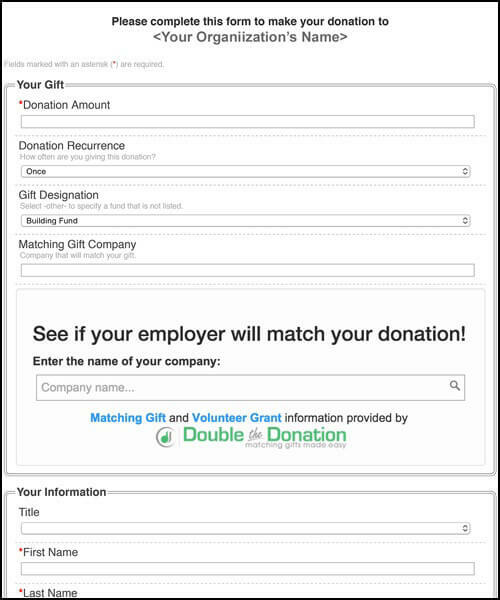 Here is an example of what Double the Donation's matching gift search tool looks like on a donation page. Of course, you'll need to be signed up with both Salsa and Double the Donation to take advantage of the two companies' integration. Sign up with Salsa here. Sign up with Double the Donation here. Does your nonprofit raise less than $10 million annually? Learn more about Double the Donation, the leading provider of matching gift tools for nonprofits. Here is an example of the service that Double the Donation can provide. On your existing donation pages. On your dedicated matching gifts page. On your ways to give page. 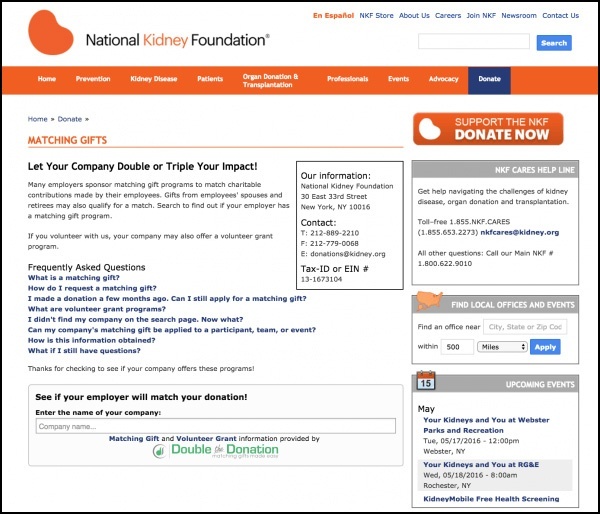 Double the Donation's tool is easy for donors to use and has boosted nonprfit earnings all across the country! Does your nonprofit raise more than $10 million annually? Learn more about 360MatchPro, the perfect matching gift tool for large nonprofits and higher education institutions. 360MatchPro also allows your nonprofit to track the match process whenever your donors signal that they might be matching-gift eligible. 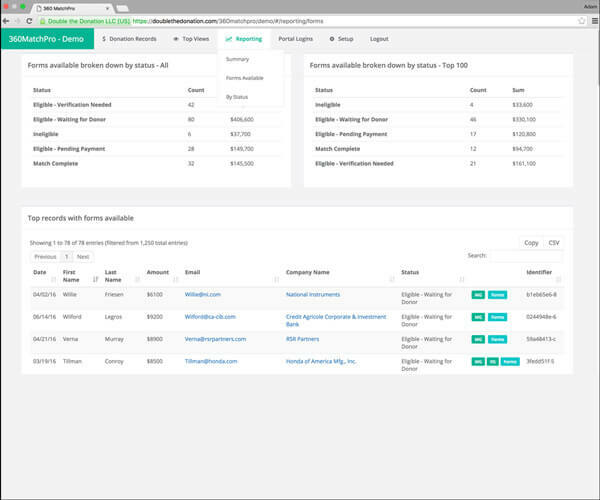 With automatic emails and actionable reports, 360MatchPro lets you focus on running your nonprofit. These 12 companies are true exemplars of the matching gift community. Although programs vary corporation to corporation, those on this list and those like them showcase the funding potential of matching gifts. If your donors work at any of the companies on this list, you should make sure they know about their employers' programs and have the resources to submit matching gift requests. An estimated $6-10 billion in matching gift funds is unclaimed annually. With company programs like these, you start to see where are all those billions are waiting to be donated. Encourage your donors to ask about their employers' gift-giving options. Discover how Salsa can help you send automated, personalized messages to exceed fundraising goals. Get a demo today! Salsa’s 5 Most Common Matching Gift Questions From Beginners. Just getting started with matching gifts? We've got answers to the most commonly asked questions from beginners. Salsa’s Ultimate Guide to Matching Gifts. If you're ready to explore, check out our more comprehensive guide to matching gifts. Double the Donation's Guide to Marketing Matching Gifts. Check out Double the Donation's guide to marketing matching gifts to your donors, complete with email templates and other marketing materials.